Blog Waldorf•ish Online Courses that simplify your school year. As students create their own "textbooks," they learn to first engage the page with a layer of transparent color, then to add layer of beauty with relevant embellishments, as in the title capitalization. 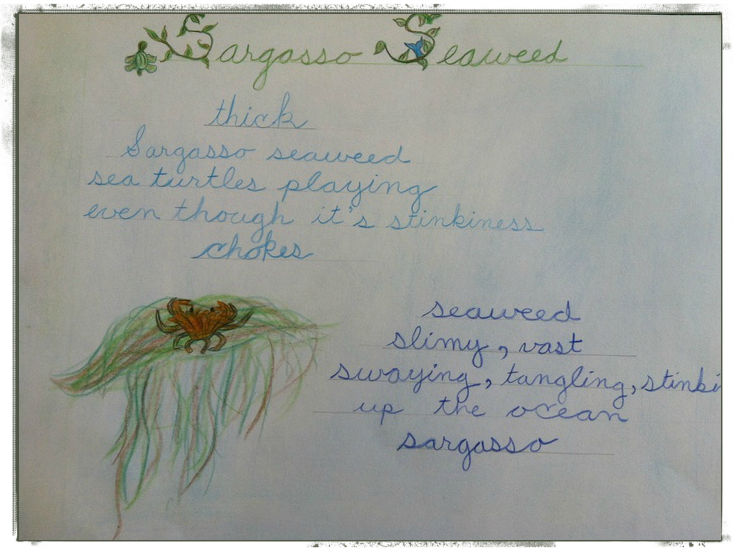 This student chose to mimic the seaweed, with a dolphin tail and turtle. Welcome! Waldorfish is Brian & Robyn Wolfe. We started this adventure in 2012 out of a desire to make Waldorf training more accessible to class teachers in remote locations and to homeschooling families everywhere! Read more, click here. Click here for a full list of schools we work with.